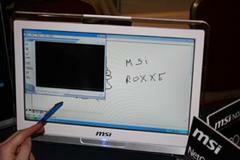 2009 marks the year MSI plans to convert those world dominating ambitions into an actuality, by attempting to take a lead in the all-in-one PC market with its Wind NetOn models. Before the doors opened at CES this year, we already knew they were planning to impress with a range of netbooks and notebooks. What we didn’t know, was that it’d be unleashing an all-in-one touchscreen PC (think HP TouchSmart and Eee Top). Press release spiel says the Wind NetOn is a “killer product”, coming in 16, 19 and 22-inch offerings – I say, it’s not quite “killer” (as we’ve seen models like this before), but it is a super thin and aesthetically pleasing, wall-hanging PC, with the ability to command at your fingertips. By adding a few extra inches onto your screen, you’ll get a few more specs for your inches (or money). The 19-inch AE190, as well as boasting a16:9 screen and a large HD, digital multimedia interface, packs Intel’s new dual-core Atom processor, therefore consuming less energy, and making it the first all-in-one PC to include this technology. The 20-inch AE2003 is a little more entertainment orientated, with full HD, a 16:9 1920 x 1080 screen resolution, Blu-ray drive, WiFi and an Intel Core 2 Duo CPU that’ll be able to handle the likes of Vista. There’s no word on pricing at the moment, so expect an update soon.